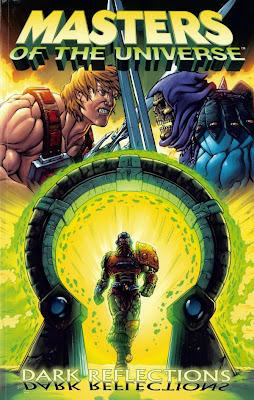 Masters of the Universe: Dark Reflections (2004) collects issues #1-6, the full run, of volume 2 of Masters of the Universe, which was originally published by Image Comics in 2003. It was written by Val Staples and illustrated primarily by Emiliano Santalucia and Enza Fontana. Here, Skeletor’s latest assault on Castle Grayskull is foiled, causing Man-At-Arms to be pulled into another dimension and strange occurrences to happen throughout Eternia. What jumps out immediately is that this is a darker, grittier MOTU than that to which we’re accustomed, and that includes the cartoon on which these comics are based. The fighting is intense, and there’s blood, a swear or two, and even some blatant killing. And yet, to Staples’ credit, this is all done in such a way that it never feels unfaithful to the spirit of the 200X cartoon (if not that of the ’80s MOTU). The writing suffers a bit from some unduly expository dialogue and a stilted lack of contractions, but Staples does a number of other things well, including the interplay between Adam and Teela and the depiction of Skeletor’s minions as giant, overpowered monsters. The mirror dimension of this story is potentially extremely interesting, but the reader is only given brief glimpses, and it’s never explored as fully as we’d like it to be (who doesn’t want to see tyrannical King He-Man?). But even so, there’s more than enough to make the story go, and on the balance, it’s pretty satisfying. Overall, the art is excellent. The attention to detail is outstanding, and the characters, settings, and backgrounds all look good. The only real complaints are that sometimes the action poses look stiff, and sometimes a lack of shadows makes the characters look as if they’ve just been overlaid on the backgrounds. On the whole, Dark Reflections is a solid, entertaining story placed fairly effectively in a grown-up Masters of the Universe world.